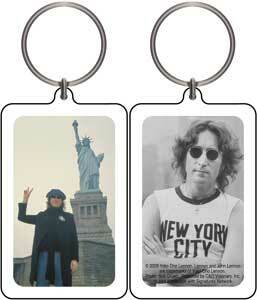 This Lucite John Lennon Lucite key chain has 2 different images. One of him in a t-shirt that says "New York City", and the other side has a picture of John with the Statue of Liberty in the background. Perfect gift for the Lennon or Beatles fan. Official John Lennon merchandise.